Hardware and software to control 3D printers and CNC machines, such as routers, lathes and mills. The Replicape is blazing fast. It runs on with a BeagleBone Black, with a 1GHz CPU and two 200MHz PRUs. The Replicape is extremely versatile. Control up to five 2 amp stepper motors, two servos and four fans. The Replicape is stealthly silent. Uses industry leading TMC 2100 stepper motor drivers, which have incredible low noise. The Replicape is smart and connected. Interact with your printer via browser while simultaneously printing. Looking to purchase? You can find the Replicape from ThingPrinter or at Seeed Studio. 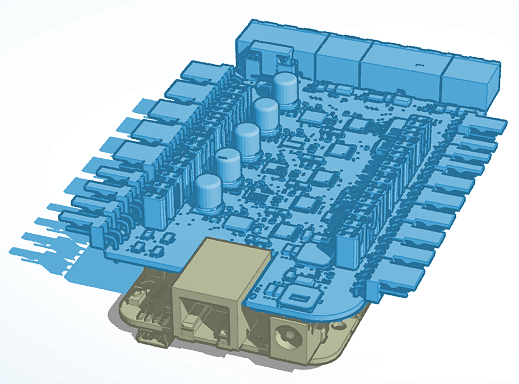 Once you’ve purchased your Replicape and Beaglebone Black, you’re ready to get started! Check out the Getting Started guide. There are several different projects that contribute to this platform. © 2017, Replicape, ThingPrinter Sphinx theme based on the Pretty Docs design.